Here are a few hand-pulled monotype prints, easily done at my home studio when I don’t have access to a press. Both monotype prints made use of two plates, in this instance small copper plates that I had around the studio. 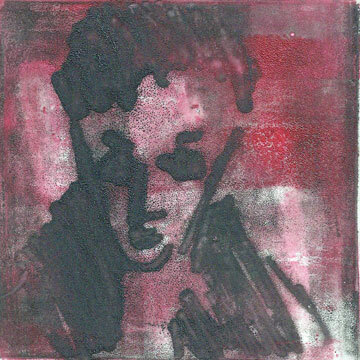 Black-eye Charlie (4 x 4 inches, 10 x 10 cm) a hand-pulled monotype print on mylar film, using two copper plates, one inked in black and the other in red. 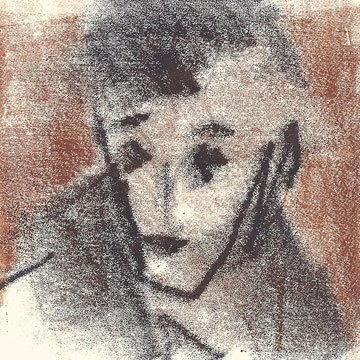 Charlie (4 x 4 inches, 10 x 10 cm) a hand-pulled monotype print on low-weight paper, using the residual ink on the two copper plates used for the first print on mylar. If you are interested in the history of monotype prints, which goes back to Blake, Bonnard, Degas and other impressionnist painters, you might want to visit What is Monotype Reference.com. Le monotype est une technique qui donne une ambiance très spéciale et laisse la joie de la surprise. L'intérêt de le réaliser à la main est que l'on peut doser la pression avec plus de finesse qu'avec une presse où la pression est uniforme.